This is a blouse, I believe. 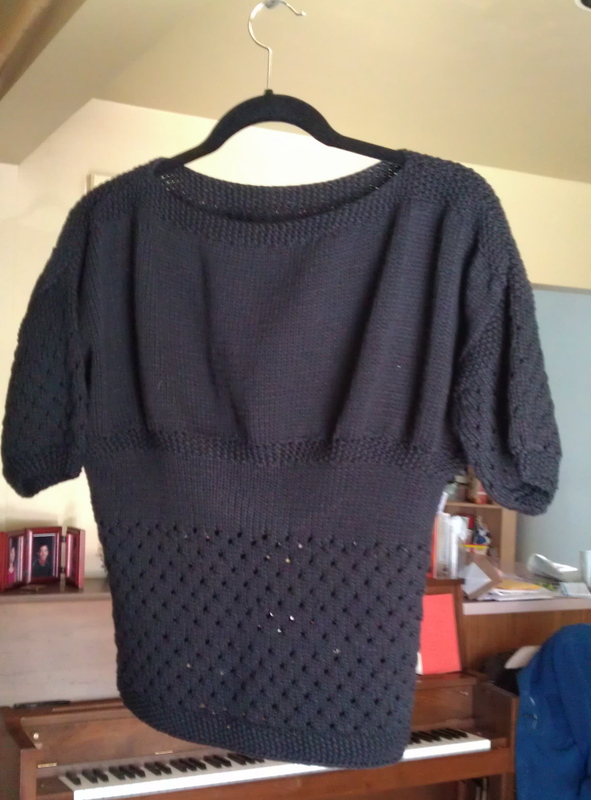 I’m still not too sure what defines a blouse, but anyway, this is a knitted womens top made with incredibly nice yarn. I compared it to the Martha Stewart brand I used for DJ and they’re almost identical. Even better, this thing was knit in one piece (except the arms), so I hardly had to make any knots myself! And what did I make with this effeminate article of clothing, you ask? A beanie, of course! I tried taking some interesting pictures of it, but there’s not much you can do with a beanie, so all my pictures ended up looking the same. Thanks to my friend, Tim, for the use of his head and left eye in my picture. Much appreciated. 1. 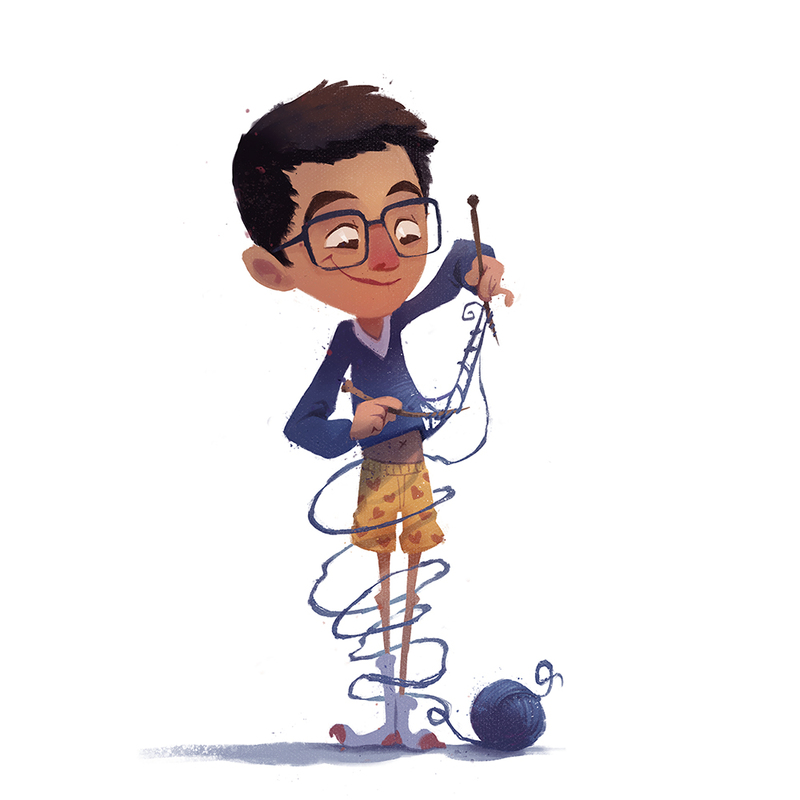 Use really good yarn. You are basically wearing a blouse on your head when you wear my hat. If you’re cheap like me and can’t afford Martha Stewart sponsored yarn, go to your local thrift shop, find something that makes you say, “Ooh, this material feels nice on my skin,” and then make a hat out of it. The majority of my hats that failed were made of Red Heart Super Saver Yarn. I don’t want to hate on any yarn brands, but Red Heart Super Saver Yarn is the worst. 2. Block. I know I’ve lauded the method of blocking in almost every post, but it is honestly the best way to go from “You made this yourself, didn’t you?” to “Wow! I can’t believe you made this yourself!” And, specifically for hats, blocking smoothens out any bumps made by the decreases and gets rid of the pointy top due to casting off. 3. Double the brim. 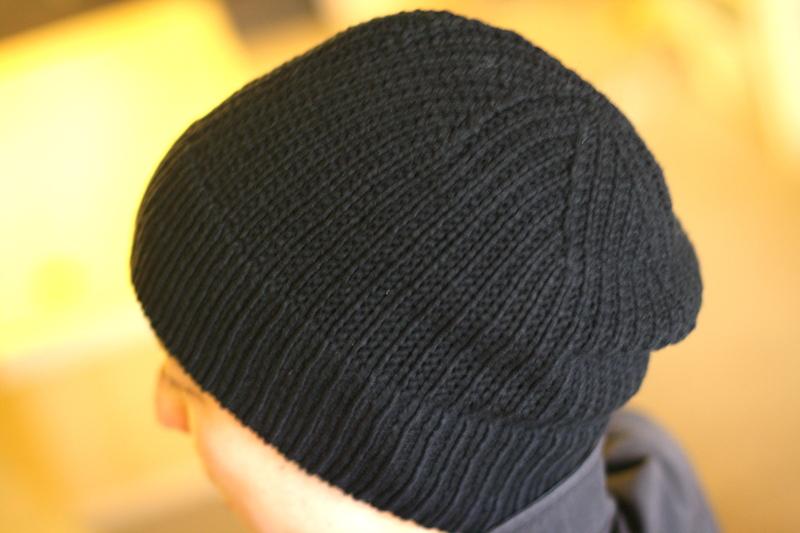 If you look at most knit beanies bought in the store, you’ll realize that the brim is very elastic and thick. This is because most companies will knit a very long brim, fold it in half inwards, and then stitch it together. This makes it the thickest and warmest part of the hat and also gives it double elasticity for cone-heads and egg-heads alike. It also gets rid of the ugly cast on row at the very bottom, and instead gives it a professional rounded edge. So there you have it. My three secrets. Just remember, UBD. or BUD. or DUB. Sorry, I’ve been playing too much Scramble with Friends. If you haven’t noticed by now, this is my very first project that is meant to be worn by the male gender. And if you’re a knitter, you know that knitting male apparel is an entirely different ball game. The name of the game is camouflage. It’s time to put away bright colored yarn and your bejeweler and take out a nice subdued skein. Don’t go thinking up creative ways on how to turn an animal into something wearable. Just do a quick google image search and copy the first thing that pops up. Abandon all ideations of originality and aim for what everyone else is wearing. I know it sounds like I’m verbally bashing my own gender’s attire philosophy, but I’m not. It’s just a different mindset. Girls like it when people notice that what they’re wearing is hand made. Guys like it when they can go through an entire conversation without anyone pointing out something about their clothing that sticks out. 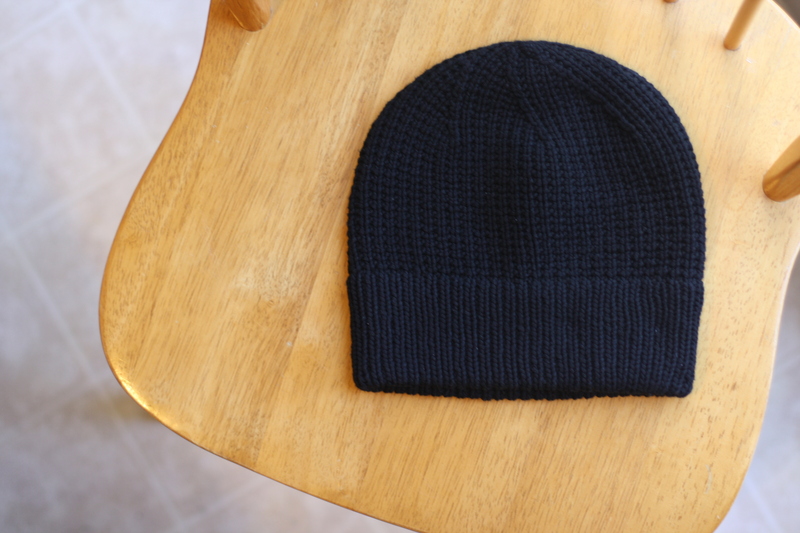 In making this beanie, I believe that I succeeded in making the ideal male garment, if I do say so myself. Firstly, this beanie is unremarkable in every way. Not a single flourish or design anywhere. The hat itself is completely black. Not ash grey or charcoal. Black. Plain black. 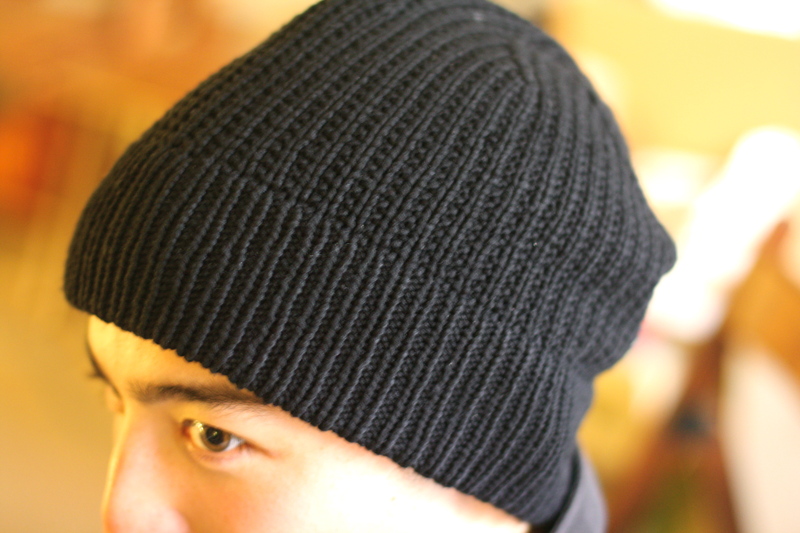 Secondly, go ahead and type in “men’s beanie” into google images. The first image you will see, just below, “Did you mean: mens beanie” is Gavin Rossdale wearing a beanie not unlike my own. You see?! Not only do celebrities wear these beanies, but even everyday people in Berkeley! Now, some of you may be thinking that I just got someone to wear my beanie in Berkeley so I could say that everyone wears them. But I am proud to say that I have no idea who this person is. 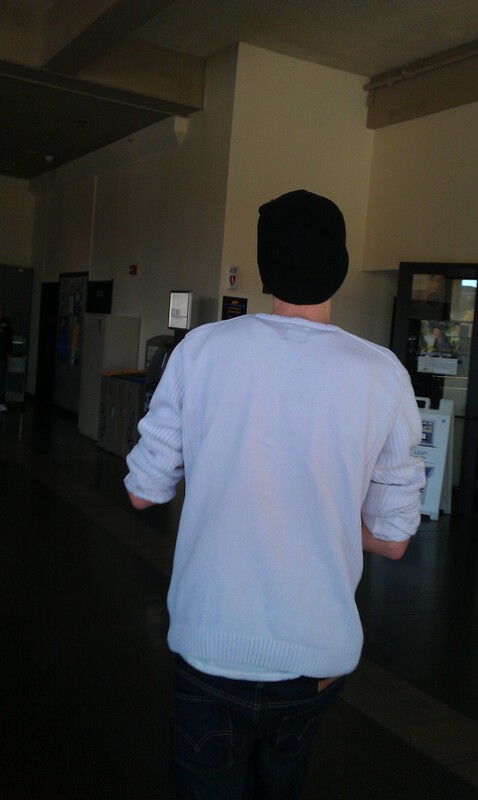 I just followed really closely behind him with my camera until he walked into the bathroom. 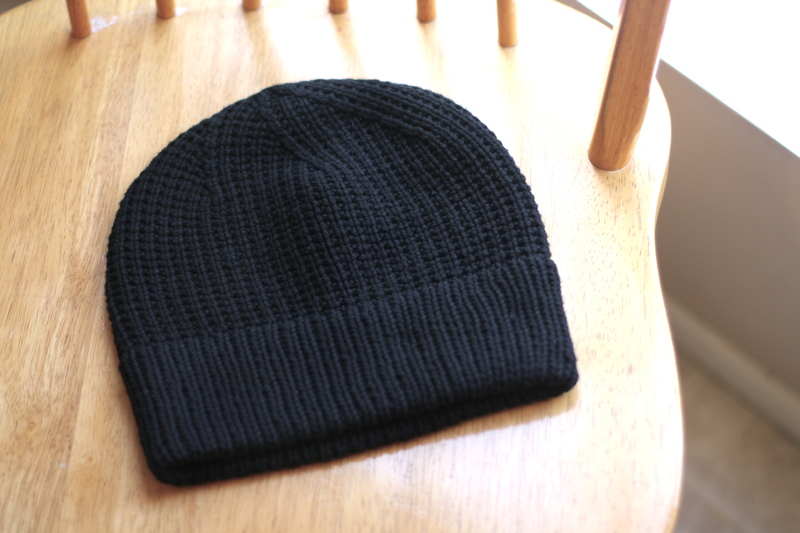 I think I’ve proven beyond a reasonable doubt the masculiknity of this beanie, so for you male readers out there who would love to have a beanie that everyone else already owns, I have just the thing for you. ***Gavin Rossdale is an English musician who was the lead singer of the bands Bush and Institute. He is married to Gwen Stefani.